1. Heat the olive oil in a heavy based saucepan or casserole dish and fry the braising steak in three batches until browned all over. Set aside. 2. Add the onion and celery to the pan and cook for 4–5 minutes until beginning to soften, then stir in the garlic, cumin seeds, fennel seeds, paprika and cayenne and cook for a few minutes more. Add the chorizo and cook for 2–3 minutes, then stir in the peppers and finally add the chopped tomatoes, beef stock, browned braising steak and season. Bring to a simmer, turn the heat down and cook over a very gentle heat for an hour and 20 minutes until the meat is really tender. 3. 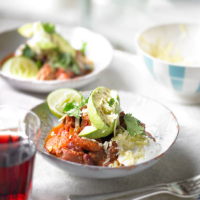 Stir in the kidney beans and fresh coriander and serve with rice, wedges of avocado drizzled with olive oil and lemon juice, soured cream, and strong Cheddar cheese, grated and sprinkled on top.